If it is flat, that is a bad sign. This video fails the "be careful in the bush" concept. What if you get really sick? The reward is not nearly as big as the risk. Would you eat a can of beans with the end pushed out? This reminds me of a trip to the BWCA. After a week we had some gin to drink and little else except water. Late one afternoon we finished a long portage and I asked my friend if he would like some gin on the rocks. I put some clean round pebbles in the bottom of a tin cup with gin and some lake water. He tasted it and said "this is one of the best drinks I have ever had." I recall telling this story before in another thread...so if that is true sorry for the repeat. I was hiking up a mountain on the AT in Georgia in the hot summer and thought I saw a mirage ahead...a six pack of beer still relatively cold...water beading up on the outside. Noone was around so I decided it was unamerican to let cold beer go to waste and downed one on the climb while carrying the rest. A while later a couple of guys came down the trail looking for their "extra" beer that didn't fit in their cooler. They didn't mind that I had taken one for the effort of carrying the rest and shared another at the top of the mountain. I almost camped with them since they had so much it looked like they would need my help, but decided wisely to move on and be ready for a 15 mile hike out the next day. I have taken a little red wagon with a cooler full of beer and fresh food twice on backpacking trips. The trail was relatively easy but still required hoisting the wagon a few times with the handle and a rope tied to the rear axle. We hiked to a lake with no one around and had the wives along. Some of the really fun trips. I have found lots of stuff by eddy shopping on rivers. While hiking in Kauai, Hawaii, many years ago, we came across cans of beer in several streams. Turns out there was a hash house harriers running event at the same time. I think they gave us some. That said, I'd have to be pretty thirsty to drink out of a random can I found. I once came across a can of beer held down in a stream with a rock on top of it. It was the Jenkins Ridge trail in the Smokies; a very remote trail that doesn't get much traffic. I waited for about 30 minutes and went for it. I think it was a gift, but admittedly will never know. I normally don't drink watery beers and this was a Bud Light; but sometimes beer is about the moment. It was good. I have found beers, cameras, a baggie of weed and other booty on the trail, availing myself to some of these gifts. I once stumbled upon a pot plantation in a rugged section of the San Gabriel Mountains. My reaction was more of fear than good fortune on this discovery, and high tailed it out of there! I would drink it in most cases (unless there is an owner near). I like such gifts. Depends on how it looks though. Jeffrey hit it on the head=hows' it look? I might drink it but have never found a can of pop or beer that wasn't rusty or had a bullet hole in it. I have found many things tho like 5 scythe blades in a bundle in the deep woods, a chunk of coal where coal shouldn't be, a tractor part, broken skidder chains, a golf ball sized piece of garnet on a mountain top, tools, chairs, an ancient cage, chicken coop, glass, 2 35mm cameras which got returned to owners, a trail of food which I think a bear had stolen the night before and the bag was ripped and I happened to be the first one on the trail the next day-I took all that and ate it. Found full unopened liquor bottles and took them, found a pile of US Mail bags under a brush pile, empty I believe a power line crew had stolen them and took what they wanted burned the mail and buried the bags-, found clothes, found water bottles, trash, glasses, a ski, found a person on a search barely alive but lived, found a rock hammer, signs, license plates, a motorcycle gas tank, woodstove and more, much of which I dragged or carried out. A few years back, Barbara and I had gone backpacking in the Sierra. On the way back to the trailhead, as we got to the final fork in the trail I spotted something green on the trail. I picked up the wad of paper, and discovered that the green paper had a picture of Andrew Jackson and several "20" numbers. Some poor soul had dropped a $20 bill. I looked around in all directions, then shouted a "HALOO!" Hearing no answer and no other human in sight, we hiked back to the car. I asked the one person there if he had lost anything on the trail. He said no, so we put all our gear in the car and headed toward home, stopping at a favorite restaurant, The Black Bear, one of a chain in California. We made good use of the $20. While hiking in the Grand Canyon I found a can of something along the edge of the Colorado River. The aluminum can's label had completely worn off from being in the river for who knows how long, perhaps lost by a rafting party. The tab on top was still intact. So I opened it and it turned out to be some kind of beer, it was very cold from from being in the river. It tasted okay, though I could not tell what brand it was. I was thirsty so I drank it! On a bicycle tour once I found a bottle of Coke sitting along the road just near a rest area. It had not been opened yet and being early morning it was still cold. I stopped, picked it up and drank it. I see a lot of things along the road when cycle touring, usually figure lost by someone who stopped, got out, sat it on the car top and then forgot it was there and drove away as it dropped off. Once in Yosemite valley I was day hiking along the Mirror Lake trail below Half Dome. I found a down jacket (it was winter) laying on the ground. I picked it up and laid it on a rock beside the trail, saw no one around and left it thinking the owner was closeby. An hour later I came back by and it was still laying there. So I thought I would take it to the ranger station. When I went to carry it I found a passport, 2500 dollars in travelers checks and 20 pin joints of pot inside the inner pocket. I decided to keep the joints and when I got to the village turned it over to the rangers at the back country office. I figured whoever the owner was did not need the hassle of the feds for the weed. I never heard any more about it. Another trip in the Grand Canyon, I was down at the Little Colorado River and found a old metal 5 gallon can with about two weeks of food inside. Most was in baggies, some was still in the original can's. Along side the can, stashed in a rock ledge was a inflatable sleeping pad or simple raft. I inventoried the food and put everything back inside the can with the list I wrote down of the contents on top and sealed it again, placing it back where I found it. Years later I looked and found the can still there and opened it, everything was just as I had left it. Later I saw a old photo of Harvey Butchart, who was a 45 year math professor at NAU (Northern AZ University) down in Flagstaff. 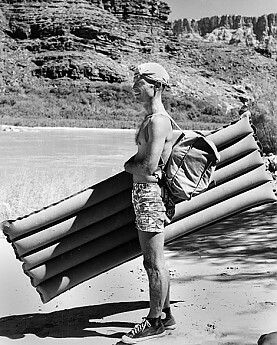 He was standing along the Colorado River with a raft that looked just like the one had found with the food cache. I imagined the cache was one of his. That was about 15 years ago I last saw the cache, Butchart died in the late 80s so I bet the cache is still there? This is the photo I saw of him. I bet whoever lost that jacket with their passport and travelers checks was very grateful you found and returned it, Gary. That is, unless they were too nervous (paranoid?) to return for it due to the other contents. I guess this is like finding a "Message in a Bottle". I'm guess the message is saying...Don't drink it! I diid find a bottle with a message in it when hiking at the lake and it looked like a child letter to its Mom. It was about loving Mom.